The Center offers events throughout the academic year. Upcoming events are listed below. Read about the Center's 2017-2018 events. Dr. Plucker is the Julian Stanley Professor of Talent Development at Johns Hopkins University. He holds a joint appointment at the Center for Talented Youth and School of Education. 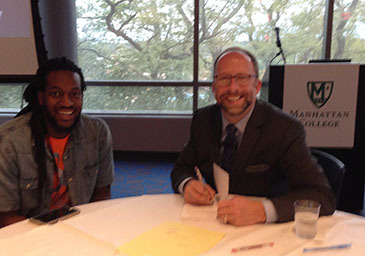 He presented his work on Excellence Gaps in Education (http://hepg.org/hep- home/books/excellence-gaps-in-education) to Manhattan College faculty, students, and our community partners including schools and Community based organizations. Approximately 183 people attended the event. He believes that we can foster excellence in our poorest schools. He challenged the audience to start to chip away at the gaps and create contexts where every student can develop their talents. His book “Gaps in Educational Excellence” was given to the students and he signed each book at the event. He has become involved in a local school in the Bronx since the event and is working on developing the context for students to develop their talents and has included one Manhattan College student this summer in working with the children. 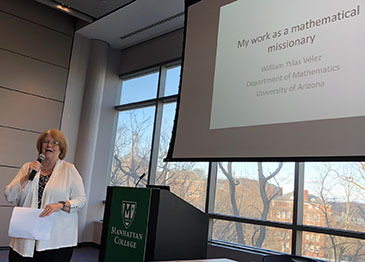 Dr. William "Bill" Yslas Vélez is a University of Arizona Distinguished Professor of Mathematics, an Elected Fellow of the American Association for the Advancement of Science and a fellow of the Association for Women in Mathematics. At Manhattan, Dr. Velez held a large gathering for faculty and students. Dr. Vélez spoke about his personal path in mathematics, the role of faith in his work, diversity and inclusion, and how to increase the number of mathematics teachers. He also did a smaller workshop for the Mathematics majors and Mathematics Education majors. 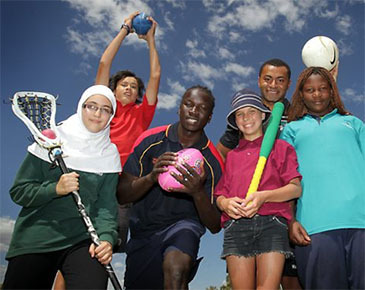 Dr. Dowler addressed the Power of Sport and Human Rights. High School Articulation: Fordham Law School’s John Feerick Center for Social Justice – under its Legal and Economic and Educational Advancement Project presented a workshop on assisting children and their families to access high quality secondary education. The educational component of LEEAP was born out of the recognition that students from families with low incomes graduate from college and attend quality secondary schools at a much lower rate than their more affluent peers. To work against this inequity, LEEAP seeks to enhance the capacity of middle schools and high schools serving low-income populations and education-oriented community-based organizations to provide effective high school application and college readiness / application programming. Undergraduate and Graduate students as well as our community partners attended the workshop. Aa a result of understanding how important the work is, the Center for the Study of the Future of Education applied in the spring of 2018 for a VISTA worker to help bring this valuable project to more schools in the Bronx. The Manhattan College project “the Road to College: the right High school” to more of our partner schools and Community based Organizations.